Pace of Change: Are Law Schools Keeping Up? Lawyers operate in an increasingly complex, fast-changing world, as do the educational institutions that prepare law students to become practicing attorneys. Are law schools keeping up? On Feb. 1, 2012, a team of attorneys filing class actions against law schools across the country added 12 more institutions to their lawsuit list, bringing the total to 15. The lawyers stated they intend to file 20 to 25 additional lawsuits every few months, aiming to add "as many law schools as possible into the fray," noted one participating attorney in a National Law Journal report. The lawsuits claim the schools distorted their graduate employment data, thus deceiving prospective students about career opportunities. June 15, 2012, marked the release of Failing Law Schools, written by Brian Tamanaha, a Washington University in St. Louis School of Law professor. In his book, Tamanaha argues that law school is a raw deal for most students, saddling them with heavy debt, poor career prospects, and stagnant salaries. Three days later, the American Bar Association (ABA) released employment figures showing that, as of nine months post-graduation, only 55 percent of the 2011 graduating law class had found full-time, long-term jobs that required bar passage. This news followed on the heels of a National Association for Law Placement press release stating that graduates faced the "worst job market yet," with only about two-thirds of 2011 graduates having obtained a job requiring bar passage. The above are just a few indicators that these are trying times for law schools. Saying law schools are under siege would be an exaggeration, but they're definitely under scrutiny. That's nothing new. The legal profession has always engaged in a lively debate about the role of law schools and how good a job they do in preparing students for the real world of practice. Such discussion "is perennial," observes Margaret Raymond, dean of the University of Wisconsin Law School. "But there's a bit more urgency about it now because of concerns about the cost of legal education and the mismatch between the number of students graduating and the tough job market." Here we examine some of the key issues confronting law schools today and what the future might hold. Weighing in with their perspectives are the deans of Wisconsin's two law schools and other law education leaders on the national scene. The current dismal job market usually gets blamed on the economy. But William Henderson, a professor at the Indiana University Maurer School of Law, says the roots of the problem go much deeper and started earlier. His job-trends research using U.S. Census Bureau data reveals that law jobs peaked in 2004, long before the recession. "A primary reason people keep coming to law school is that they have a calling to do the work. It's a public service." "That was the high-water mark," Henderson says. "We've had fewer jobs every year since. But the population of law students has continued to grow, creating a supply-and-demand imbalance." While many may want to believe the law job market will rebound when the economy does, "the only basis for that is a hope and a prayer," Henderson says. "Traditional law jobs are not going away, but they won't be a source of growth." One reason for that, Henderson explains, is the booming law job market in India and the Philippines, both countries in which many people speak English. Clients seeking to cut their costs push firms to outsource routine legal tasks to overseas attorneys, rather than paying junior associates in the United States to do the work. As law employers have trimmed their new hires for various reasons, law schools have been slow to reduce enrollments. The number of law graduates spiked in 2012 at 44,495, up 4 percent since 2006, according to the ABA, which accredited 10 new law schools during that same period. A few law schools, however, have begun to cut incoming enrollments. For instance, Northwestern University School of Law (in Evanston, Ill.) is considering reducing its incoming class this fall, and Hastings College of the Law (in San Francisco) plans to trim its total enrollment by 30 percent over the next three years, according to the Wall Street Journal. Law school applications numbered 65,119 in 2012, down 14 percent from the previous year, according to the Law School Admission Council. As of early August, neither Marquette University Law School nor the U.W. Law School knew if its fall 2012 incoming class would be smaller than last year's. Marquette boosted its ability to help graduates land their first job by adding a third career-placement professional to its staff, according to Joseph Kearney, the law school dean. The administration accomplished this by reallocating an open, nonfaculty position to the career center. "We expanded our career planning staff," Kearney says, "without expanding the headcount of the law school." The "too many lawyers" problem is ripe for discussion. As Kearney sees it, "a primary reason people keep coming to law school is that they have a calling to do the work," he says. "It's a public service." Consider, too, notes the U.W. 's Raymond, that Wisconsin has roughly a half-million citizens with unmet civil legal needs (according to the State Bar's Bridging the Justice Gap study of 2007). "To me, the question isn't so much whether we have too many lawyers," she says, "but rather how do we control the cost and debt of law school so that lawyers who are graduating can meet people's legal needs." "The question isn't whether we have too many lawyers, but rather how do we control the cost and debt of law school." Law school is too expensive, and has been for a while, says Thomas Lyons, past president of the Rhode Island Bar Association and a frequent speaker on legal education and the future of the legal profession. College education costs have climbed at four times the rate of inflation, he notes, while law school tuition increases have outstripped those for undergraduate education. "There's been no downward pressure on tuition," he explains, "because there's been this perception that law graduates will make six figures when they get out. So people were willing to pay a lot for law school." But that perception of earning power was never accurate, Lyons says. Even before the recent recession, starting salaries for lawyers didn't follow a classic bell curve. "It's more like a camel with two humps," he says. One bulge shows up at the six-figure mark, while the other sits at the $40,000-to-$60,000 range. A big trough lies in between. "People are spending a lot of money on law school," Lyons says, "and when they come out, they find at least half the jobs don't pay enough to make it worthwhile for them to have spent that much. That's a problem." And it's an even bigger problem if law students paid their way on borrowed money. In the past, tuition didn't vary that much across schools, Lyons points out, because so many people wanted to study law. "We had an unusual market," he says, "in which the Ford or Honda law school was able to charge about as much as a Mercedes law school." Lyons predicts that will change. He believes the day is coming when law schools will have to compete with each other based not on U.S. News & World Report rankings, as they do now, but on price. "I think that will happen," he says, "because people are going to say, 'Why pay so much to get an education if I'm likely to end up in one of those $40,000-to-$60,000 jobs?' At the same time, I think there is a market for the Ford or Honda law school, if the price is right." 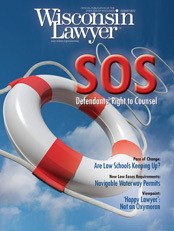 Like many lawyers, Lyons feels law schools need to do more to prepare graduates for practice. That's increasingly important in a tough economy, he notes, when firms need their new hires to be ready to pitch in immediately. When his four-lawyer firm recently hired a new associate, "we were looking at how ready this person was to help us now," Lyons says. "That was a big factor. Is this person sitting in front of me ready to go to court in a week or two?" The person they chose had taken several clinical programs in law school. "We've had fewer jobs every year since 2004. But the population of law students has continued to grow, creating a supply-and-demand imbalance." Still, many law schools don't encourage their students to take clinicals, Lyons notes. Other schools don't even offer clinicals, for three key reasons: They're expensive because of the low student-to-faculty ratio required; faculty don't want to teach clinicals because these don't enhance their academic reputation, which relies on scholarship; and many law professors' backgrounds don't prepare them for teaching clinicals. Another hurdle to clinicals, Lyons adds, is that there's no reward for offering them in either the ABA accreditation standards or the U.S. News & World Report rankings. Yet, law employers cry out for more practice readiness. "In the long run, what may happen is that law schools will have to offer clinicals if they want a high rate of employment for their graduates," Lyons says. "Then those law schools would become more popular among prospective students. But that would require a well-informed group of law school applicants." Still, law schools can't prepare young lawyers for everything, points out Sherry Coley, immediate past president of the State Bar of Wisconsin Young Lawyers Division. "A common theme I hear among new lawyers is the need for mentoring on the job," she says. She counts herself "among the lucky ones," as her firm, Godfrey & Kahn, provides strong mentoring support, both formal and informal. Coley also is cochair of the State Bar's Challenges to New Lawyers Task Force, created by past president Jim Brennan in early 2012. The task force will survey new attorneys to learn their top concerns. "The goal is to fill in the information gaps," Coley says, "and hold some listening sessions at the law schools this fall." Recognizing the gap between theory and practice in legal education, more than 30 law schools across the country have formed an alliance to make experiential legal education the norm, not just an afterthought. Northeastern University School of Law in Boston will convene the alliance, which will hold its first symposium in October. The practical component has long been part of the curriculum at both of Wisconsin's law schools. For instance, at the U.W. Law School, third-year students can opt to take the lawyering skills course taught by some 70 practicing attorneys and other professionals from across the state. The course gives students opportunities to develop skills in negotiating, interviewing, oral advocacy, navigating ethical issues, practice management, and more. The U.W. also offers a diverse mix of clinical programs. One relatively recent addition is the Alternative Dispute Resolution Clinic, in which students gain hands-on experience in mediation, a growing field. The Law and Entrepreneurship Clinic, created a few years ago, operates like a law firm and provides free legal services to start-up entrepreneurs. In any clinical program, the law school has an obligation to "not get under foot with practicing lawyers in the state," Dean Raymond says, by taking billable work away from practicing attorneys. "One of the things I love about the Law and Entrepreneurship Clinic is that it navigates that divide very effectively," she says. "There's been no downward pressure on tuition, because there's been this perception that law graduates will make six figures when they get out." The students provide free services to start-ups that can't afford to hire a lawyer, and practitioners who serve on the clinic's advisory board assist with cases. When the start-up attains financial viability and can afford legal services, it will have an established relationship with an attorney who knows the business. "Somebody who needs the work to make a living can do it," Raymond says, "and we move on to the next client who needs help and can't afford to pay." Practical experience is also a key element in Marquette's law curriculum. "Law school is both graduate school and professional school," Dean Kearney says. "In my estimation, it's essential that we have one foot in the academy and one foot in the larger world of the legal profession." Approximately 70 percent of Marquette's 2011 graduates participated in some sort of clinic, judicial internship, or supervised fieldwork program. "We have the benefit of deep and historic ties within Milwaukee and the surrounding region," Kearney says. Thus, students can choose from diverse placements at area government offices and nonprofit organizations, such as the AIDS Resource Center, Kids Matter, Legal Action of Wisconsin, and many more. More than half of Marquette's law students participate in the Public Service Program, the school's pro bono initiative, for which they receive no academic credit. "It inculcates the values and an ethic of doing pro bono work in our students," Kearney says, "while they're working side by side with practicing lawyers." In recent years, Marquette often heard from practicing lawyers that graduates needed stronger legal writing skills. Marquette developed two solutions. It hired six full-time legal writing faculty for its first-year legal writing course, rather than using one full-time professor plus numerous adjuncts, as in the past. The reasoning was that full-time teachers would be more available to offer students more one-on-one help. In addition, Marquette launched an intramural moot court competition. Students can enroll in an appellate writing and advocacy course, first offered eight years ago. The top 20 or so students in the class get invited to compete in the moot court competition. Kearney explains that previously Marquette students had participated in extramural competitions, which they still do. "But the difficulty we found," he says, "is that in those competitions the emphasis is more on oral argument, rather than the writing component." By creating its own competition, Marquette was able to inject more emphasis on legal writing competency. Traditional legal jobs won't go away, but there won't be enough of them to absorb all the people who want to be lawyers, contends Indiana's Henderson. Still, there are huge opportunities in the legal industry that "lie at the intersection of law and technology," he says. Each year, U.S. News & World Report (USNWR) publishes its rankings of U.S. law schools accredited by the American Bar Association. Released in April, the 2011-12 survey ranked 195 schools, with the top 50 schools (actually 55 schools because of ties for rank positions) rated 1 to 50, and the remainder falling into tiers 2, 3, and 4. Rankings are based on a weighted average of 12 measures of quality, including reputation, selectivity in admissions, placement success, faculty resources, and overall rank. Specialty rankings are based solely on nominations by legal educators at peer institutions. Prospective law students consult rankings as they sift through their law school choices; legal employers use them to help assess the merits of job candidates. But the rankings remain highly suspect among law school administrators. In fact, some critics have compared the USNWR rankings issue to the swimsuit issue of Sports Illustrated, arguing that the major purpose of both is to sell magazines. On its website, the USNWR notes there is currently much controversy over the veracity of some schools' placement data. Each year, the schools report to the ABA how many of their most recent grads had jobs lined up nine months after graduation. The USNWR collects this and other data when it surveys the schools for its annual rankings. Starting with the 2011 graduating class, the ABA will require more detailed jobs placement data. For more information, visit www.usnews.com/edu. He points to up-and-coming entrepreneurs who are developing what he calls legal inputs and legal products, rather than legal services dispensed by the hour. These new ventures will need lawyers on their teams. That's why Henderson believes law schools must focus on teaching new skill sets to their students, such as collaboration, teamwork, communication, flexibility, and more. These skills will equip new lawyers to work in any sort of complex, changing, knowledge-worker environment. "Students need more than just knowledge of the law," Henderson says, "which is what law schools teach now. They need broader workplace skills so that whether they go to work in a nonprofit, or a government agency, or a law firm, or a business that applies technology to law, they have the skills to help that organization." As Henderson sees it, this approach would deliver on that oft-made promise about the versatility of a law degree. Currently that manifests largely by accident, he says, adding, "we need to make it more explicit so we can say, 'Here are the skills we provide in law school, and lo and behold, they are highly transferable to other domains.'" Henderson is putting his own advice into action through a course he's taught for three years to 1Ls at Indiana. He's structured the course to focus on activities that develop six qualities or abilities: self-awareness, resilience, empathy, asking questions, making presentations, and active listening. Working in teams is a major component of the class. The goal is to prepare students for whatever professional role they land in after law school. It's difficult and sometimes frustrating to teach nonknowledge skills, Henderson admits. His program has entailed "a lot of trial and error," he says. "It's not for the faint of heart." But, in Henderson's view, these skills are critical to preparing lawyers for the jobs of the future. Giving these skills the attention they deserve will require systemic changes in law schools, he says. Institutions have to figure out how to reward people who are willing to focus on curriculum and pedagogy – on what law schools teach and how they teach it, he contends. As the system is designed now, law professors advance their careers through scholarship. "Our entire reward system is based on publication," Henderson says. "Publications and legal reviews are the legal academy's billable hour. They are an obstruction to needed changes." "Everybody wants to do what a handful of elite law schools have been doing for decades. It's not responsive to what students need for the kinds of jobs that are out there." Law schools are a bit of an aberration in the academic world, says Brian Leiter, professor and director of the Center for Law, Philosophy and Human Values at the University of Chicago Law School. Colleges and universities take on different forms: liberal arts colleges, research universities, and community colleges, with varying emphasis on teaching and research. "But every law school tries to be the same," Leiter says. "Most follow the Chicago model or the Yale model … pick your example." He notes that law schools typically hire their faculty members based on intellectual and scholarly potential, and the school's prestige and reputation rely on its scholarly mission. As a result, the current law school has become "one shoe that's supposed to fit everyone," Leiter says. The ABA accreditation standards feed into this situation, and the U.S. News & World Report rankings exacerbate it, he says. If the ABA were to modify accreditation standards, Leiter thinks we might find out if there is a market for various kinds of law schools. "The difficulty right now has to do more than anything with the fact that we have one model that's increasingly dominant," he says. "Everybody wants to do what a handful of elite law schools have been doing for decades." While that model meets the hiring needs of one type of legal employer, it doesn't suit all the different sorts of legal employers in today's market, Leiter says. "And," he adds, "it's not responsive to what students need for the kinds of jobs that are out there." Surely law schools will need to evolve in a changing world. Entrenchment in old traditions solely for tradition's sake serves no useful purpose. Still, some factors will remain constant into the future, says the U.W. 's Raymond. "I'm pretty sure society is not going to stop needing lawyers," she says, "and lawyers will need a lot of the foundational skills they have been learning for a long time. As I often say, lawyers will be reading, writing, thinking, and talking well into the next century. What we don't know is the format in which they'll be doing that." The chart below compares U.W. and Marquette law school data for the 2010, 2011 school years. The article "Back to Law School" (Wisconsin Lawyer, June 2001) also compared the U.W. and Marquette law schools for the 2000-01 school year. Data expressed in comparable terms from the 2001 article are included in parentheses in the chart below. *See related sidebar "About Law School Rankings"